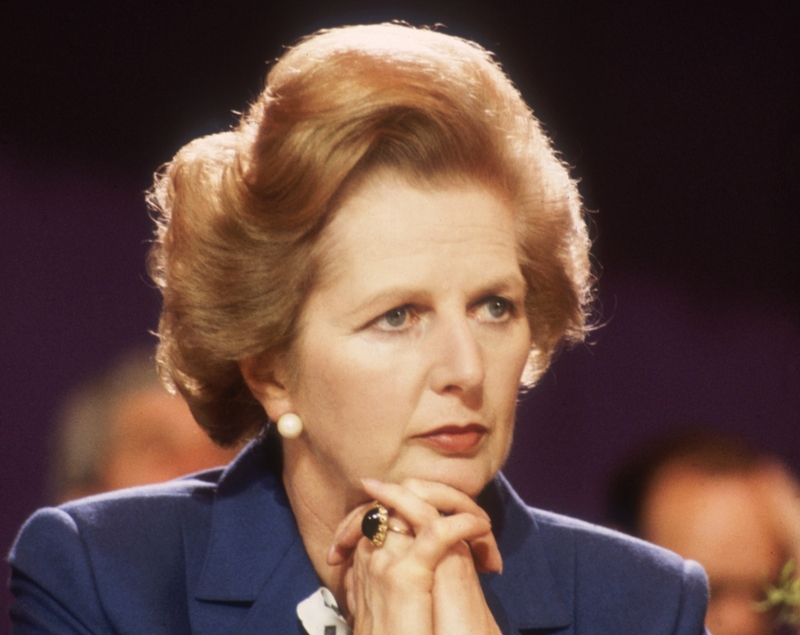 Book News: Margaret Thatcher Authorized A Posthumous Biography : The Two-Way Also: Christopher Hitchens on being spanked by the "Iron Lady"; Victoria Beale skewers Paulo Coelho; and Robert Silvers on the meaninglessness of the phrase "in terms of." Britain's then-Prime Minister Margaret Thatcher at the Tory Party Conference in Blackpool, England, in 1981. Margaret Thatcher, the former British prime minster and "Iron Lady" who died on Monday, authorized a biography to be published after her death. Written by Charles Moore, it will be published by Allen Lane, an imprint of Penguin UK. Allen Lane said in a statement: "The biography was commissioned in 1997 on the understanding that it would not be published during Baroness Thatcher's lifetime. Charles Moore was given full access to Baroness Thatcher's private papers and interviewed her extensively." The book, titled Margaret Thatcher: The Authorized Biography, Volume One: Not For Turning, will be published "immediately following her funeral" next week. On a related note, let's all take a moment to remember the time Thatcher publicly spanked Christopher Hitchens. From Hitchens' "On Spanking," in the London Review of Books: "I stooped lower, with an odd sense of having lost all independent volition. Having arranged matters to her entire satisfaction, she produced from behind her back a rolled-up Parliamentary order-paper and struck — no, she thwacked — me on the behind. I reattained the perpendicular with some difficulty. 'Naughty boy,' she sang out over her shoulder as she flounced away. Nothing that happened to the country in the next dozen years surprised me in the least." Victoria Beale takes down Paulo Coelho in a vicious essay for The New Republic titled, "The Gospel of Success: Paulo Coelho's Vapid Philosophy": "If you've absorbed any of Coelho's incredible commercial success, without actually reading the 65-year-old, Brazilian author, it's genuinely shocking to realize just how shoddy and lightweight his books are, how obvious and well-trodden their revelations." That is what Coelho gets for writing things like this in his latest book: "It is better to have loved and lost than never to have loved at all." Robert Silvers, the founding editor of The New York Review of Books, tells New York Magazine about phrases he'd like to ban from his magazine: "Even more insidious and common is in terms of, a fine phrase if you are talking about mathematical equations or economic functions in which specific 'terms' are defined, but it is just loose and woolly when you say things like 'in terms of culture,' for which there are simply no clear terms."